Looking to Join a Chorus? High Quality Singing: We sing a wide variety of music, including commissioned works by well-known composers such as Randall Thompson and Clifton Noble, Jr. We also provide part recordings for our major works. Vocal Workshops: We host annual workshops led by local vocal coaches focusing on important singing techniques such as tone, tuning and diction. 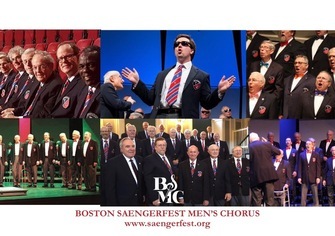 Collaboration with Well-Known Singing Groups and Soloists: We perform concerts with nationally known groups such as the Yale Whiffenpoofs, the Morehouse College Glee Club, and Southern Rail. Performances in Historic Venues in the U.S. and Overseas: We have performed at Carnegie Hall, Fenway Park, and the Royal Albert Hall in London, to name a few. We also regularly sing at the Naturalization Ceremony for new citizens at Faneuil Hall. Camaraderie: We sing in a rehearsal and performance atmosphere that is satisfying to good recreational singers, skilled amateurs, and trained vocalists alike, and we hold camaraderie among the whole ensemble to be among our highest values.